It was a crisp Saturday morning, real estate agents planting their a-boards on street corners and hanging auction flags outside homes, while I enjoy a soy latte and a bowl of granola reading the weekend paper, whilst my 2 year old son is sharing his pancakes with a newly made friend, a large Golden Retriever. Who am I buying breakfast for!? One of my favourite sections of the weekend paper is the finance/stock-tips section (after the property section of course). Why? It’s entertaining, it humors me, most importantly, I need to know what nonsense our clients could be reading. This daily market news and commentary can be challenging to our investment discipline. Some messages stir anxiety about the future while others tempt you to chase the latest investment fad, all in an attempt to generate a greater return. Without getting involved in speculation and gut-feel decisions, how can investors target dimensions of higher expected returns and make confident investment decisions in order to enhance the return of their portfolios in a way that is sensible, in a way that is persistent across time and pervasive across markets? I’ve put together a few charts (using Returns 2), looking back as far as we can go, to help us find answers to these questions. Let’s start off with the basics. It’s common knowledge that over the long-term, stocks outperform bonds, right? If you don’t believe me, here’s the evidence. An investment of $10,000 back in January 1980, would be worth $186,914 if you had invested in bonds, and $375,559 if you had invested in shares (to February 2016). That’s more than double your return! Of course, you took on the risk. There it is, the first dimension of higher expected returns – the stock market over the bond market. Okay, okay, that was quite basic, but I did need to start somewhere to paint the picture that I’m looking at. So let’s dig a little deeper. If the stock market is our investment universe, where should investors tilt their portfolios in order to gain exposure to dimensions of higher expected returns. Decades of research has identified company size as a dimension, which also points to higher expected returns. As you can see from the chart we constructed below, not that we would endorse putting all your eggs in one basket – but if you had invested 100% of your portfolio in smaller Australian companies (as represented by the Dimensional Australian Small Index), your return would have been over 77% greater than the return of the ASX 200 Index. So we’ve now identified two dimensions that point to higher expected returns, stocks over bonds, and smaller companies over larger ones. Want to know what absolutely dwarfs what we’ve seen above? Investing in companies that are under priced when compared to their relative value, such as price to earnings, price to book, and dividend yield. Click here if you want to know more about value stocks. As you can see from the chart below, the index of ‘value’ stocks, over the long-run, has rewarded investors handsomely. Well and truly beyond the return of the S&P/ASX 200 Index, in fact, over 3.5 times. In this brief note, we have identified three dimensions of higher expected returns, that is, stocks over bonds, smaller companies over large, and value companies over growth. We have also identified that there is a way investors can structure their portfolios to target dimensions of higher expected returns without getting involved in speculation and gut-feel decisions. There is evidence to support these strategies, they are persistent over time and are pervasive across markets (if you want further evidence, feel free to ask, we’d be happy to share more data and evidence that’s not only Australian, but also global). Investors do however, need to be patient, as these dimensions are not present each and every day, but over the long-run we can clearly see they pay off. This diversified hypothetical portfolio would be valued at $593,335 at February 2016. A pretty decent return for a $10,000 investment, wouldn’t your agree? The most interesting and surprising aspect of this exercise (for me), was the fact that the hypothetical portfolio’s largest loss was less than the largest loss of S&P/ASX 200 Index, even though the hypothetical portfolio’s return has been greater than that of the S&P/ASX 200 Index. Unfortunately, we are not wired for disciplined investing. We follow our emotions and react to speculation and recent performance. Make investment decisions based on evidence, not speculation. Get the help of a professional, unbiased, unconflicted adviser to challenge your thinking and keep you on track. It’ll all be worth it in the end. A different viewpoint on negative gearing. Australian property investors want house prices to drop, but also want negative gearing to stay. Oh the conundrum. You may have recently read about a hedge fund manager and an economist (sounds like the beginning of a joke, although not, it certainly could be) posed as a gay couple in Sydney’s Western suburbs viewing houses and meeting mortgage brokers for research to determine if there’s a housing bubble. One could have probably done that in the comfort of their own office. But hey…a tax deductible trip to Western Sydney – why not. Their conclusion (this is for real and not a joke): Australia (as represented by Western Sydney according to the two gentlemen) is in a property bubble (brilliant observation guys, we didn’t know that Australia’s property prices were inflated). Apparently we will see a 50% decline in house prices (although no time frame was given). Banks will cut their dividends entirely (yet again, no time frame was given). Bank stock prices will fall by 80% (you guessed it, no time frame given either). The skeptic in me says these guys are crying out for a little more attention. Well, they’ve got it. Now what? Let’s take a look at reality shall we? Since the mid 1990’s and early 2000’s, we’ve seen a downward shift in consumer prices (inflation) and nominal interest rates. Since then, home ownership has declined, with the most obvious factor being a rise in house prices. 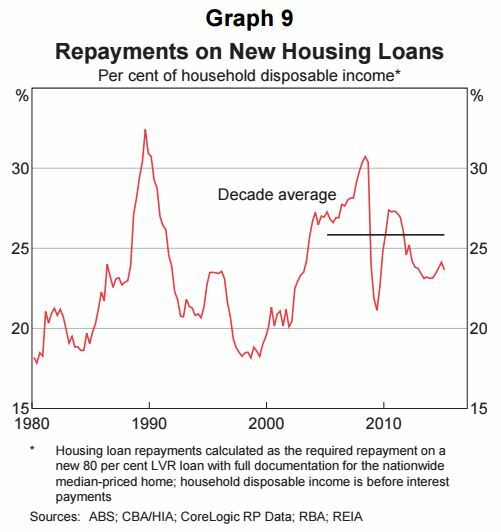 Notwithstanding the sharp rise in house prices and the higher levels of mortgages taken out to fund these purchases, repayments on housing loans are well below previous peaks (see below). Do we have an affordability issue? One of the biggest demand drivers that continues to be overlooked by so many, is population growth (see below). 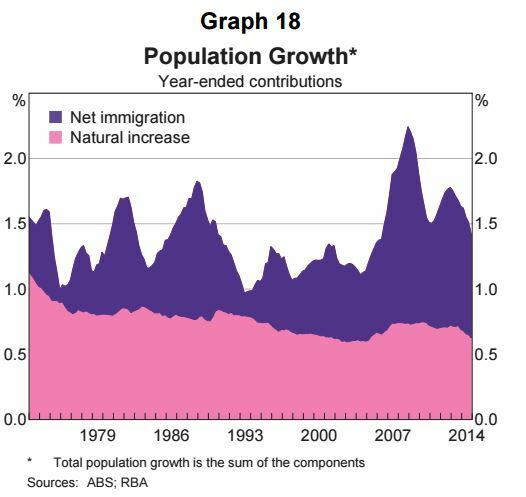 Although natural increase in population growth has certainly been anything but stellar, net immigration (as we all know) has been significant. 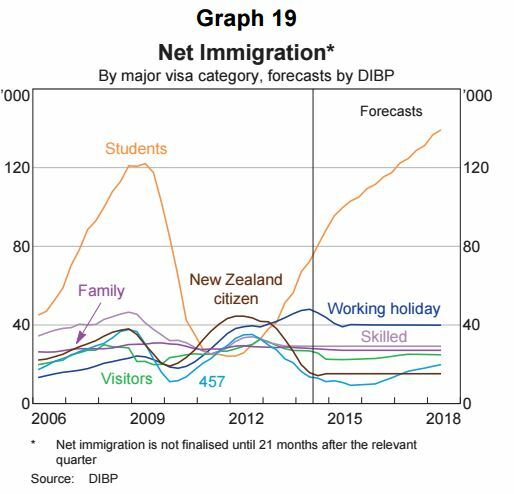 Not only have we seen (and continue to see) our population grow, there is one visa category which has been going gangbusters. You guessed it, students. Australia’s easing of immigration rules have meant that it is now easier for students to become permanent residents following graduation. These people too need to live somewhere. Now that we have established that there is a demand for Australian property, what are we doing about it? The flow of new construction (until late) has been very slow in responding to the needs and demands for housing. We all know that Australia faces a particular challenge around the distribution of our population. We are highly urbanised and a large portion of our population is usually concentrated in a few large cities (unlike population density in comparable countries – this is why an apples-for-apples comparison with Australia is so difficult – but hey, we do it anyway). We continue to remain sluggish in responding to demand. Not the latest data, but gee, you get the picture. Mind the gap. Vacancy rates continue to remain low and we continue to have a cumulative under supply of 200,000 dwellings since 2001! What do you think will happen to prices when you have a supply issue? It’s basic economics. 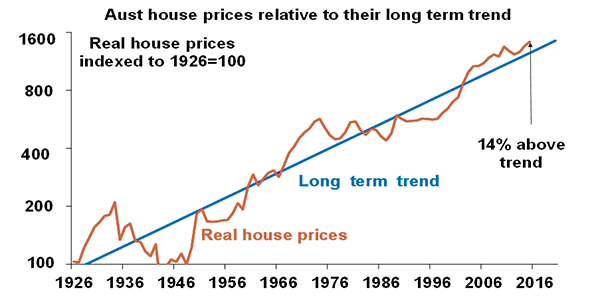 To put things into perspective, here (below) are real house prices since 1926. I am not ignoring the fact that property prices are inflated. Both relative to short and long term trends (see below). Before we jump to such conclusions, let’s think about the underlying issues and address these. Anything else is a complete waste of time and money. The market will sort itself out. It always does. In the meantime, think longer-term. Think about unlocking more land. Think about accessibility and infrastructure. Think about creating satellite cities. Unfortunately, the removal of negative gearing will not solve our real problem. Supply.